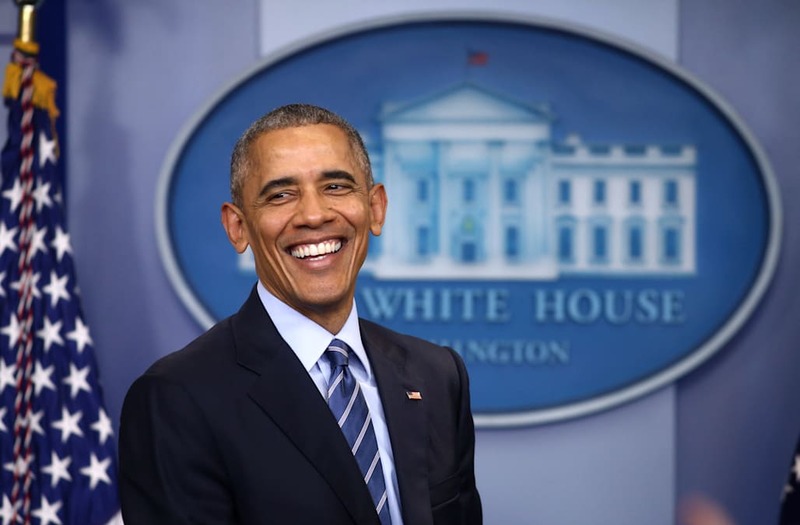 On January 10, 2017 in Chicago, Illinois, United States president Barack Obama will deliver his historic Farewell Address, marking his last public speech to the public as president. Thousands of hopefuls lined up outside the McCormick Place convention center in downtown Chicago during the weekend of January 6 in biting-cold temperatures in hopes of scoring a ticket to hear Obama's final speech as President of the United States. Tickets on sites like eBay and Craigslist are going anywhere from the low hundreds up to a whopping $5,000. And keep in mind, there's no guarantee or proof of authenticity ensuring that any of these tickets are in fact legitimate. "Many resellers are only accepting cash payments, and one seller is attempting to make the transaction safer by requesting the trade happen in front of a police station. For those buying, each official ticket has on it a QR code and foil logo." "The only safe way to buy these tickets, if you must, is to use paypal (and not the Friends and Family option) and write out a contract on the invoice....the scammers will accept cash only and their posts claim they're located in the city and suburban locations. This is a head's up so your heart is not broken when you arrive at McCormick Place on Tuesday." Obama's speech is set to begin at 5 pm Tuesday evening. David Letterman, President Barack Obama and First Lady Michelle Obama laugh after signing 'Happy Birthday' to the USO in honor of their 75th anniversary, during a comedy show organized by United Services Organizations (USO) for members of the military and their families, at Andrews Air Force Base, May 5, 2016, in Joint Base Andrews, Maryland. The program is also being live streamed for active duty service members stationed at bases domestically and abroad. Academy awarding-winning actor George Clooney reacts to a question alongside Senator Barack Obama during a Washington news conference about his recent visit to the Darfur region of Sudan, April 27, 2006. Clooney and his father, journalist Nick Clooney, have just returned from a week-long trip to southern Sudan and eastern Chad where they met with dozens of individuals affected by the crisis and documented the brutal and worsening conflict in Sudan?s Darfur region. US President Barack Obama presents Paul McCartney with the third Gershwin Prize for Popular Song at the White House in Washington, DC on June 2, 2010. McCartney's appearance was part of a two-day series of events marking the award issued by the Library of Congress. President Barack Obama presents the Presidential Medal of Freedom to singer Gloria Estefan as her husband Emilio Estefan , also a recipient, looks on at the White House in Washington, DC, on November 24, 2015. Former NBA basketball star Magic Johnson attends U.S. President Barack Obama's unveiling the "My Brother's Keeper" initiative at the White House in Washington February 27, 2014. The program aims to improve opportunities for boys from minority groups. First Lady of the United States Michelle Obama, Vogue Editor in Chief Anna Wintour and Metropolitan Museum of Art President Emily K. Rafferty attend the Anna Wintour Costume Center Grand Opening at the Metropolitan Museum of Art on May 5, 2014 in New York City. Actor Bradley Cooper attends the 30th annual American Cinematheque Awards gala at The Beverly Hilton Hotel on October 14, 2016 in Beverly Hills, California. Film producer and studio executive Harvey Weinstein laughs at remarks directed at him by U.S. first lady Michelle Obama as she hosts a workshop at the White House for high school students about careers in film in Washington November 8, 2013. President Barack Obama awarded the Presidential Medal of Freedom to Lorne Michaels, TV producer, writer, comedian, and actor, best known for creating and producing Saturday Night Live. Singer John Legend attends a performance at the Kennedy Center September 23, 2016, Washington, DC. The 'Taking the Stage; African American Music and Stories that Changed America' performance celebrates the opening of the Smithsonian National Museum of African American History and Culture. Model Chrissy Teigen arrives at the 2015 MTV Video Music Awards in Los Angeles, California, August 30, 2015. U.S. President Barack Obama presents the Presidential Medal of Freedom to film director Steven Spielberg during an event in the East Room of the White House in Washington November 24, 2015. U.S. President Barack Obama awards the 2012 National Medal of Arts to film producer George Lucas during a ceremony in the East Room of the White House in Washington July 10, 2013. On Friday, January 6 in Washington D.C., USA , Kelly Rowland was one of the celebrity guests present for First Lady Michelle Obama's final remarks as First Lady at the 2017 School Counselor of the Year event in the East Room of the White House. Actress Tracee Ellis Ross, of ABC's "Black-ish," arrives at the 68th Primetime Emmy Awards in Los Angeles, California, U.S., September 18, 2016. US President Barack Obama prepares to present actor Robert De Niro with the Presidential Medal of Freedom, the nation's highest civilian honor, during a ceremony honoring 21 recipients, in the East Room of the White House in Washington, DC, November 22, 2016. Actor and director Tyler Perry hugs US President Barack Obama during a campaign event at Tyler Perry Studios March 16, 2012 in Atlanta, Georgia. President Obama is spending the day traveling to Chicago, Illinois and Atlanta, Georgia to attend private and public campaign events. Actor Jon Hamm poses at the 2016 amfAR Inspiration Gala in Los Angeles, California U.S., October 27, 2016. Singer Stevie Wonder is greeted by U.S. President Barack Obama after receiving the Presidential Medal of Freedom during a White House ceremony in Washington, November 24, 2014. The Presidential Medal of Freedom is the Nation's highest civilian honor, presented to individuals who have made especially meritorious contributions to the security or national interests of the United States, to world peace, or to cultural or other significant public or private endeavors. Al Roker and his wife, Deborah Roberts arrive at the state dinner in honor of President of Finland and the Prime Ministers of Norway, Sweden, Denmark and Iceland at the White House in Washington on May 13, 2016. Comedian Chris Rock arrives at the 68th Annual Primetime Emmy Awards at Microsoft Theater on September 18, 2016 in Los Angeles, California. First Lady Michelle Obama and Lena Dunham discuss Let Girls Learn at The American Magazine Media Conference at Grand Hyatt New York on February 2, 2016 in New York City.